Free Shipping Included! Barbie Dynacraft Bike, Pink, 18'' by Barbie at Melon City Bike Club. MPN: 8094-57TJD. Hurry! Limited time offer. Offer valid only while supplies last. 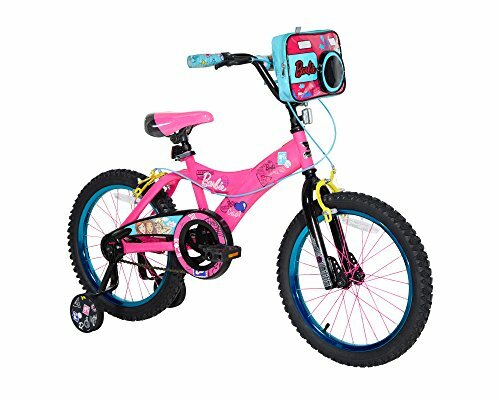 You can go anywhere on the 18'' Barbie Passport girls' bike, which features all-terrain tires and adjustable training wheels for a well-balanced ride. You can go anywhere on the 18" Barbie Passport girls' bike, which features all-terrain tires and adjustable training wheels for a well-balanced ride. The sturdy steel frame is customized with a deluxe paint finish and travel-inspired decals. The cute camera-style bag and authentic Barbie design add a fashionable touch. The rear coaster and front caliper brakes keep riders in control of the bike so that she can have the confidence to master riding.